The Wailua Hideaway vacation home borders the Opaekaa Stream just behind Sleeping Giant mountain on Kauai's East side, in the Wailua Homesteads just minutes from Kapaa town. 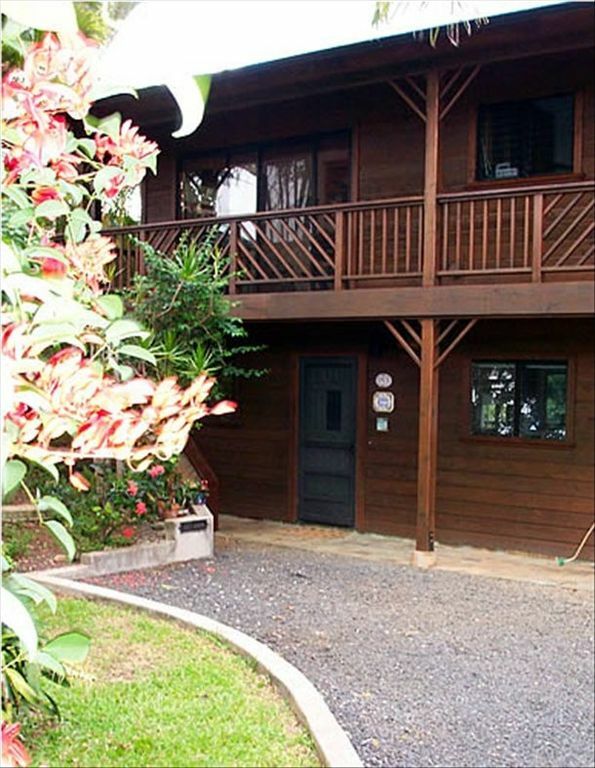 This one bedroom, one bath Kauai vacation rental can comfortably accommodate up to four guests. Private, peaceful and fully-equipped, the Wailua Hideaway is the perfect 'home away from home' for your next Kauai vacation. At Wailua Hideaway, we offer you one of the best private vacation rentals on Kauai. Out the living room and bedroom sliding glass doors and windows you'll enjoy beautiful mountain views. The rear deck is excellent for bird watching. Relax and enjoy the feeling of peace and serenity that comes with staying in a private vacation rental, tucked away in a scenic and quiet neighborhood. All the details have been considered and provided and the on-property owners are happy to make suggestions on what to see and do on the Island. Enjoy preparing meals in the fully-equipped kitchen or a BBQ on the private redwood lanai overlooking the stream and mountains. The living room offers a wonderful view of the surrounding tropical landscape and is tastefully decorated with Island-style furnishings. The sofa also makes into a comfortable double bed. Wailua Hideaway is located on the ground floor of a custom 2-story Redwood home that was beautifully crafted and is meticulously cared for. The bedroom is spacious and inviting with stream and mountain views and its own private lanai. With doors and windows on three sides, the room stays cool and comfortable even on the warmest tropical days. The King bed is comfortable and lavishly adorned. The tile bathroom is well ventilated and includes a shower/tub, towels and paper products. The Wailua Hideaway features a private laundry room for your convenience as well as all linens, beach towels and laundry soap. You'll appreciate the convenient location of the Wailua Hideaway vacation rental which is just minutes from the Lihue airport, beautiful white sand beaches, shopping, restaurants, the Wailua River and so much more. Not far from the Wailua Hideaway is the Coconut Marketplace home to numerous shops, restaurants and local/live entertainment. The East side boasts many of Kauai's finest restaurants including Kintaro's (Japanese cuisine and sushi bar), Kauai Pasta and more. The gracious hosts of Wailua Hideaway will be happy to provide you with suggestions for the best places to dine and things to do on your Kauai vacation. The Wailua River is one of the most famous and traveled rivers in the State of Hawaii. A beautiful kayak trip up the Wailua River and a short hike will bring you to the stunning Ulu`Wehi Falls, more commonly known as 'Secret Falls'. Standing at approximately 120 feet, Secret Falls is a sight to be seen and the perfect backdrop for Picnics, photos and fun! Or, if you'd prefer, you can see the Wailua River by motorized boat. Several tour companies offer hourly tours up the Wailua River to the famous Fern Grotto. Tours include Hawaiian entertainment by local musicians and hula dancers. The choices of things to do on Kauai are seemingly endless. No matter what you choose to do during your vacation, you are sure to be comfortable and well taken care of at the Wailua Hideaway vacation rental. Also overlooking the stream feeding into Opaekaa Falls. Off street parking stall at front door. Smoking allowed on outside deck only. Wailua Hideaway is Perched Above a Small Stream at the Base of the Sleeping Giant Mountain and Hiking Trails. Excellent bird watching from rear deck. I spent six nights at this lovely home and could not have been happier with this place. If you’re on Kaua’i to explore, the unit is in a great location. Wailua is right down the road and the whole island is easily accessible. Kapaa is a cute town with everything you need. The house is in a nice neighborhood, but still feels very remote. It’s incredibly quiet and (for this city girl) dark and wild. The jungle view off the porch can’t be beat. The owners are very nice and live in the unit above. They gave me complete privacy, but as a solo traveler, it was nice knowing they were right there. The unit itself is very attractive, comfortable and user friendly. I like to cook and the kitchen had everything I needed. The washer dryer was more of a bonus than I anticipated. The owners leave nice touches like fresh flowers and chocolate. great location and great value! We loved being centrally located on the island. This condo had everything we needed, they even had supplies like ziplock bags and coffee for the Keurig machine. Highly recommended! We enjoyed our stay here. The kitchen was well equipped and the bed was very comfortable. The space was clean and uncluttered. The deck was a lovely retreat with a “Jungle like” view and sounds to fall asleep to. This location is central for touring around the island. We had a wonderful stray! Beautiful setting, with lush tropical vegetation surrounding house. Freshwater stream in back, with tropical birds. Picked oranges from tree in back, delicious. House is near west trail up Sleeping Giant ... ran for 2-3 minutes to trailhead. Kauai’s roosters wake you up at 5 or 6 AM ... all over island. You live on ground level, owners live on 2nd floor. David and Lynda we’re helpful hosts. Thank you so much for your kind review. We always enjoy hearing from our wonderful guests. Funny you mention the roosters and chickens. I'll pass along the only Kauai way to prepare these birds. Take a very large stock pot, fill with water and add the bird along with a large lava rock. After a 10-12 hour boil.......through away the bird and eat the rock. We wish you safe and happy travels. Great place, beautiful and comfortable!! Back deck is phenomenal. We really enjoyed our stay! Loved all the extra touches that David and Linda did!! The house is beautiful, the view is phenomenal. The house has all the amenities that you need in Hawaii. Had a relaxing time. Enjoyed the peace and quiet. Central location was great. The Wailua River is Just Minutes from the Wailua Hideaway Vacation Rental. Enjoy a Leisurely Ride on a River Tour to the Fern Grotto or Kayak the River and Take a Short Hike to a Beautiful Waterfall. Credit card payments are accepted through PayPal. A discount of 10% is offered for reservations paid in full at the time of booking and paid by check or money order.